Basically if you're putting an automatic transmission in your car then it's a good idea to run proper steel coolant lines up to your trans cooler. Yes, I was tempted to run rubber hose as well.. until I read about someones 5 year build going up in flames on the side of the road cos his rubber lines melted through. 3 inches is not enough space from your exhaust!! Okay so steel lines it is then. Go down to your local brake service place. I just SafeRbrakes. Ask them for two peices of steel hose, 2 metres in length each. Get them to flare one of the ends and buy the appropiate fittings for your gearbox, usually there are little brass connectors that you can take in with you to get the correct fittings. Take these long steel lines home and steal two wire coat hangers off your girlfriend. Unwind it and make it as long and straight as possible. I found this was the best way of bending up a 'template' for your lines. Lie under the car and put your brass connections back in and begin bending up to suit from this point. Follow the most obvious and easy path to your engine bay using the least amount of sharp bends as possible. Once you have your 'coathanger template' now comes the tricky part. You have to bend your 2m steel line to match as closely as possible. Just go slow and one at a time, checking it against your template. I would recommend buying a pipe bending tool as its easy to bend and pinch the line ruining it. I rigged up a make shift pipe bender out of a pulley from a handbrake cable braket. Seemed to work ok but I did screw up the first sharp bend and ended up having to cut it off. I found my first pipe came out sweet as and was easy. The second line was much trickier and took the rest of the afternoon to get right. Mainly because it had to bend sharply to go into the fitting in the gearbox. I would recommend using right angle fittings on both the inlet and outlet of your trans as its easier to make the lines fit. Then take the lines under your car and keep adjusting your bends until you are happy with it. Some people cut it at the engine bay, I took mine right up to the front before cutting them. 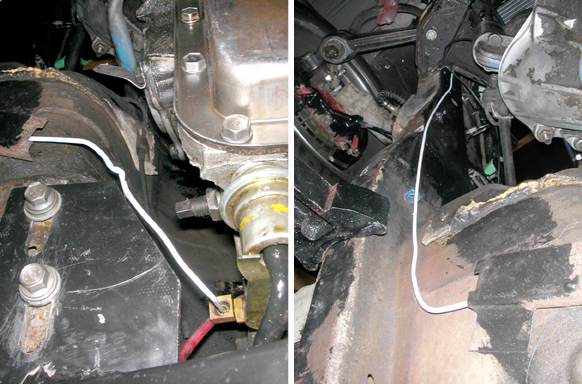 The outlet line goes into a remote filter before the trans cooler and the inlet line back into the gearbox. If my car burns down at least it won't be from a melted transmission line!